I knew today was going to be hard, my first visit to a Concentration Camp. Three years ago we had booked a tour to the Sachsenhausen Concentration Camp, outside of Berlin, but it was cancelled, something to do with it being New Year’s Day. I questioned how much I was motivated by voyeurism, how much by my interest in history, how much to reinforce we should never forget. We should never forget. Today I have been reassured that I wanted to do this to never forget. We should never forget. There were fourteen people in our tour group today, representing Denmark, the Netherlands, UK, the USA, probably elsewhere too, and I, the sole representative of Australia. Everyone was in a pair of some sort, except Gus and myself. At first I wondered from his accent what he was doing on an English speaking tour but despite this initial poor judgment, within minutes we were mates. Like most on the tour, I began to take photos from our first destination but soon stopped, for the most part. The photo at the top of this post was the first one I took and Gus happened to be caught in it. The next shot was the same scene, sans Gus. 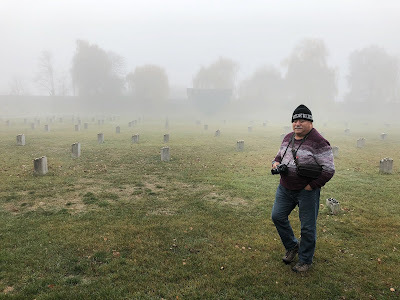 This was a cemetery with mere numbers designating unknown masses of bodies, representing the 30,000 or more who went through the crematorium at the Terezín Concentration Camp (see links at bottom of post), just outside it actually. It seemed befitting that my first really cold day on this trip was on this day. I woke to see the temperature at -3℃. I took a couple of photos within the crematorium but it felt intrusive so this is when I stopped. I also wanted to concentrate on listening more. The ashes were placed in urns which at the end of the war were found thrown in the nearby river or scattered about. Our tour guide, Sarah, had a stilted monotone voice when she spoke in English, particularly as she provided information nearly the whole hour trip from Prague to our first destination. Later, I could detect the passion and pain as she tried to imprint on us the scale and the humanity in the horrors. But let’s backtrack a little. Terezín was initially built in 1784 as a fortress outside what is now Prague,. It consisted of two sections, the small fortress and the large fortress. However, it was never required for its original purpose. 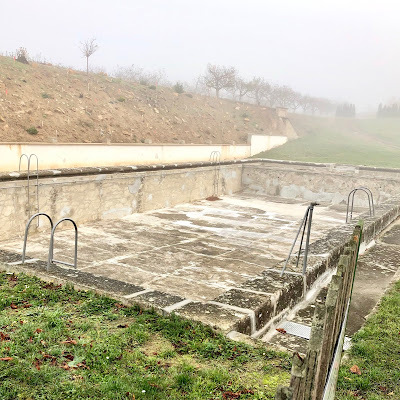 In 1942 the large fortress became a ghetto for Jews and the small fortress for prisoners, particularly political prisoners, mainly Jews who did not comply with the Nazi regime. 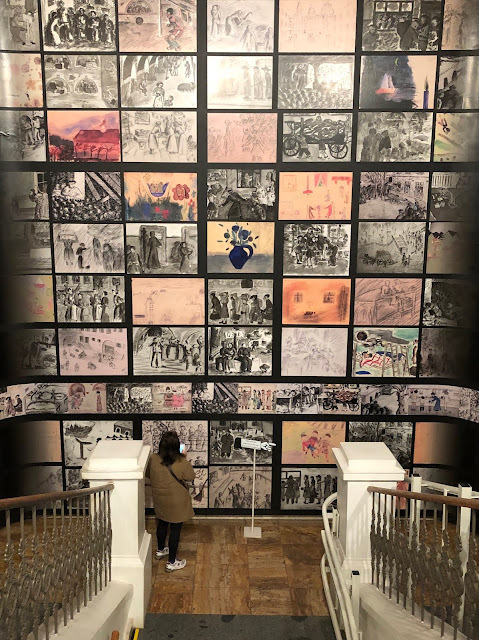 Before leaving the small fortress we entered the warmth of what was the Nazi’s picture theatre and watched a documentary that contrasted a propaganda film made by the Nazis with Jews from the Ghetto (more about that later) and pictures drawn by Jews themselves. Jarring, to say the least. Between the small fortress and the museum at the large fortress we visited a recreation of the living conditions in the Ghetto. It was here Gus broke a little, and he had to leave the room. I’ll tell more of Gus’s story later. He was probably more affected by Sarah’s stories than the recreation. Her efforts to imprint stories on our hearts were effective. My point of breaking was at the large fortress museum. Sarah told us the story of Helga. The pictures in the photo below were illustrated by Helga during her time in the Ghetto, from the time she was 12 to 14 years old. She went through four concentration camps and still lives today. For some reason it was the survival story that brought my tears. There is a book of Helga’s drawings, Draw What You See, that I will buy after my return home. More recently she has published a diary which I may also buy. Some of her story can be found here. The large fortress, the Ghetto, was actually a holding camp for Jews before they were sent to extermination, usually to Auschwitz. Many within Terezín were ignorant to this. The Nazis worked hard to keep a myth going that the people who left were moving onto better circumstances. This included forcing the damned to write to people back in Terezín about how happy they were in their new place, dated after they had been exterminated in gas chambers. Some aware of their real destiny would write a cryptic message, such as "I have found Uncle David", who had died well before the persecution of the Jews had commenced. More than 100,000 were sent from Terezín to Auschwitz. Less than 3,600 survived. Go to the websites below for more reliable statistics than mine. Construction of a gas chamber had started towards the end of Terezín’s Ghetto days but was not completed before they were ‘liberated’. Upon liberation the Russians kept everyone in the Ghetto in quarantine due to a typhoid epidemic for a time (weeks or months, depends who's talking). At the end, many who were in Terezín were the result of the Nazis evacuation of all the other camps in an attempt to cover up their crimes. Records had also been moved to Terezín, a spot considered safe for their keeping but then deliberately destroyed when the end was nigh. As briefly mentioned above, Terezín was also described as a propaganda show. A film was created of all the cultural activities the Jews were supposedly participating in this place supposedly created for their own protection. The film showed soccer, knitting and an orchestral concert. It was acted out by Jews and upon its completion the director and its performers were sent to Auschwitz for extermination. The film was apparently never used for propaganda purposes. I remember a scene showing a propaganda film of concentration camps like they were a summer holiday in the movie version of The Boy in the Striped Pyjamas and I wonder if this Terezín film was being referenced. The Ghetto was also dressed up for a Red Cross visit which fooled the inspectors, or as Sarah said, perhaps they decided it was better for their own interests not to look beneath the facade. Now Gus. Back in Chicago, Gus recently retired and needed to escape a Trump America. In February, he travelled to Panama where he lived until he was 14 years old. He has a strong Spanish accent, I assume as a result of his childhood there. When he was 14, he moved in with his brother in the USA for a few years in teenage rebellion. When he was 17, he found direction and moved to Chicago where he made a life for himself. He married, had four children, and now has grandchildren too. Three of his children live in the US but not Chicago. A son teaches English to US business people in Kuwait. His wife passed away six years ago. Gus grew up in Panama but his Mum landed in Argentina as a small girl, a refugee Jew from Romania, perhaps. Gus says his Mum could talk little about that time. She did not even know her original name because each time it was documented the official recorded it differently, not understanding the pronunciation, and may not have cared enough to want to understand. I’m guessing this is also why Gus added the “perhaps” to Romania as her country of origin. He knows her family tried to flee persecution of Jews several times but in the end decided success would be more likely if they separated. I’m not sure who else was with Gus’s Mum when she arrived in Argentina but the friends or family they were looking for and hoping to rely upon could not be found. It was a confusing and disorienting time, only partly because they could not speak the language. Thankfully, she was looked after, somehow. Of the family left behind, none have been found again. From Panama, Gus travelled to Thailand. I think because his son was there at the time, but I’m unclear on that point. He then went to Israel and told of some interesting experiences there. Gus decided around this time that he needed to visit every concentration camp he could, to honour the memory of his lost family. He didn’t use the word “honour” but that’s how I felt it. He went to Poland, Germany and now Prague with Terezín last on his list. Tomorrow he heads back to Germany. I don’t think he’s looking for answers or to find himself. He knows who he is. He knows he feels unwelcome in Trump’s America with the double edge of being Jewish and from south of the border. He is travelling on his Panamanian passport. I feel like his journey this year has been about imprinting on his soul his family’s history. Sarah would approve. During our tour, Gus invited me to join him for the next couple of weeks of his travel. Upon my polite but insistent no, he then asked me to dinner. I counter-offered with having coffee at the end of the tour. When our bus returned, Gus and I had soup and beer at a cafe nearby and listened more to each other’s stories for another couple of hours. I will be emailing him this post upon uploading it. If he ever comes to Sydney, I will happily play host. 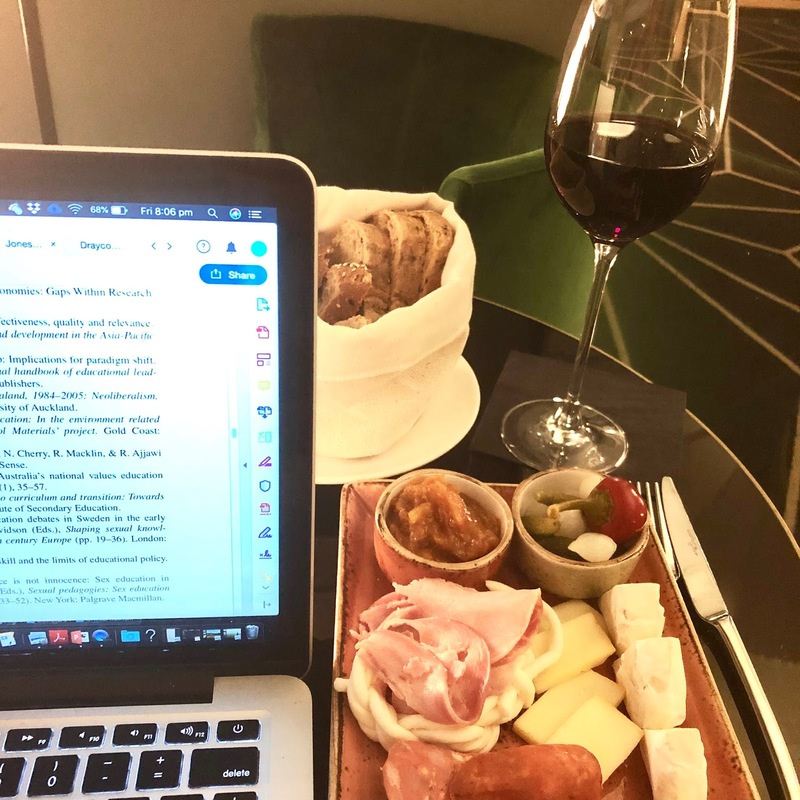 Back at my hotel as I type this in the bar, missing my usual barman who is working in the restaurant tonight, I am guiltily enjoying the finer things in life. Apparently yesterday was worldwide Beaujolais Day and the picture below shows what’s on special tonight. A stark contrast to the 100g of bread the old and infirm were permitted in Terezín.